Habit at Enchanting Floral Gardens of Kula, Maui, Hawaii. USA. March 01, 2012. Origin and Habitat: Yucca desmetiana is an old breeding of unclear origin, no habitat location recorded in the original literature. It has been named from cultivated plants and some sources suspect is a natural hybrid between Yucca aloifolia and Yucca filamentosa though it looks nothing like any other other yucca known. It is now thought to be from northern Mexico from Chihuahua to Aguascalientes to San Luís Potosí to Tamaulipas. Description: Yucca desmetiana is a soft leaved yucca which has graceful, arching, long rubbery leaves, that are bluish-grey when young, turning burgundy as they mature (especially in winter). Usually a single stem rosette when young and become multi stemmed with age. 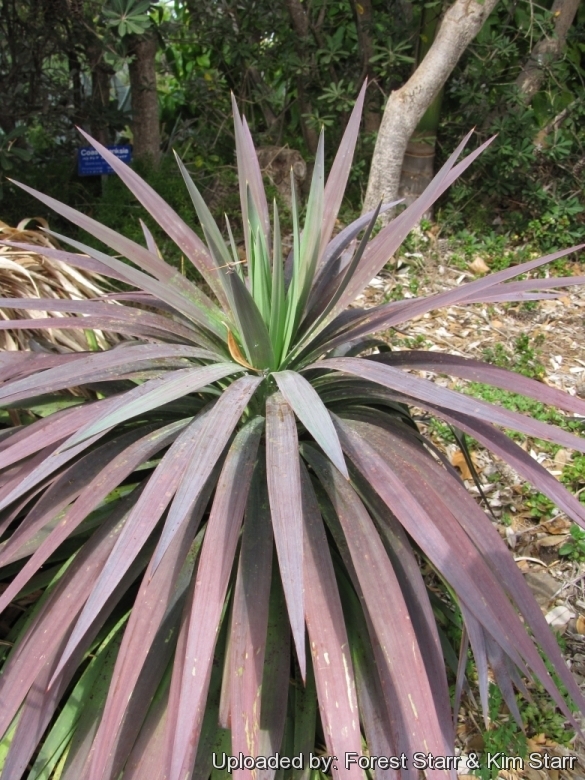 The plant is cultivated as an ornamental in many places because of its coloured foliage. Stem: 30 to 180 cm tall, 4-5 cm thick. Leaves: 150-200, in an open columnar rosette, sword-shaped, rigid, leathery rather than succulent, without an obvious spine at the apex, all more or less recurved, purplish green, 30-40 cm long, 16-18 mm broad at the middle, narrowed to 9 mm above the base, the point not pungent, the edge faintly denticulate towards the base; in the young state, the face flat, except at the point and base, the back but little raised except in the lowest quarter, the middle slightly plicate vertically. Inflorescence: Inflorescences, flowers and fruits apparently unknown. Remarks: Some authors hyphenate the epithet as "de-smetiana". Baker's original publication listed the plant as "Yucca De Smetiana". The correct spelling is without the hyphen (as per the code of nomenclature, ICN article 60.9 and recommendation 60C.5c) and with no space and no capitalization (recommendation 60C.5c). 1) Forest & Kim Starr “Yucca desmetiana (Yucca)”. Plants of Hawaii. <http://www.starrenvironmental.com>. Web. 7 Jan. 2015. 3) Wikipedia contributors. "Yucca desmetiana." Wikipedia, The Free Encyclopedia. Wikipedia, The Free Encyclopedia, 28 Jun. 2014. Web. 7 Jan. 2015. 5) J. G. Baker (1870). "The known forms of Yucca". The Garden Chronicle and Agricultural Gazette: 1217–1217. 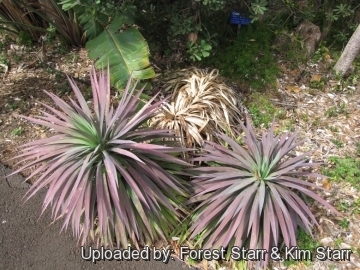 6) Landsdale Plants, “Yucca desmetiana.” <http://www.landsdaleplants.com.au/plant/yucca-desmetiana/> Web. 7 Jan. 2015. Cultivation and Propagation: Yucca desmetiana is a carefree and durable plant that provides great colour contrast and foliage interest. Plant in the garden for a unique feature or grow in decorative containers. Unlike their larger counterparts, these yuccas have not needle-tipped leaves, so you can plant them near play or walk areas. It requires little maintenance, with low water requirements and grows fairly rapidly for a Yucca. Soil: Plant in fast draining soil but can be established in virtually any type of soil . It is adapted to a dry environment, but has a good tolerance to moisture and humidity when planted in a well-draining soil. Exposure: They thrive best in full sun, but can be grown with some shade and humidity, but may become leggy. Hardiness. Best where winter temperatures stay above 0° C, but resist to -8° C in well drained soil, planted in protect and exposed to south area. Plants in containers can be moved inside during longer cold spells. Garden uses: These make great specimen plants for xeriscape gardens and blend well in either tropical or arid gardens. Small plants are relatively inexpensive, but larger ones are a fortune. These make excellent potted specimens, and their symmetrical form provides a striking focal point, ans display wonderful shadows when illuminated by night lighting. In cooler climates they thrive well in gravel garden, as they have proven quite hardy because of the excellent drainage. Propagation: Offsets. The species is also easy to propagate from stems or truncheons.